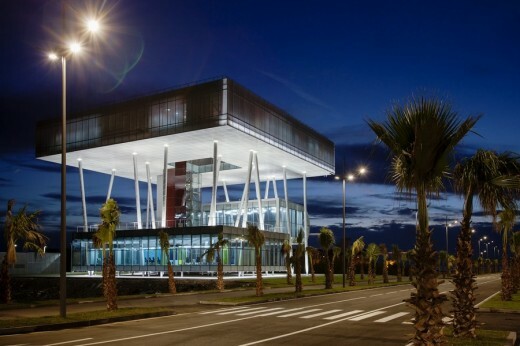 The young UK-Georgia-based practice Architects of Invention has completed a new municipality building for a city which is yet to come into being – Lazika. This marine, economic and commercial centre was intended to be one of the largest cities in Georgia. Currently, Lazika’s future hangs in the balance, as the new government decides its course of action. Paul Grimes, director of Engenuiti, describes the structure: ‘The structural frame is constructed from steel, utilizing a series of raking steel columns to produce the dramatic floated upper platform. Challenges include the seismic conditions and the sympathetic employment of local skills to achiev what will be an iconic statement of architectural ambition’. The foundation solution was for 80 piles 800mm diameter (has been installed through rotary percussion methods) and up to 25m deep. Control of settlements due to organic layers and control of potential liquefaction of the ground during a seismic event were the main concerns. A key consideration in the design was the need to control costs where possible but also to use local materials and local labour so as to give the maximum benefit to the local economy. Normally this would push the design towards a structural concrete solution in Georgia. However the complexity of the project dictated that the project is best developed using a Structural Steel Framing Solution. Lazika is a newly founded city on the Black Sea coast, located on previously uninhabited coastal wetlands. Lazika is located one mile to the south of the sea resort Anaklia and 3 miles south of Georgia’s border with Abkhazia. The name ‘Lazika’ refers to the Graeco-Roman name for the region. The city’s existence was announced in December, 2011 by President Saakashvili, and established upon the completion of the Lazika municipality building in September 2012. The city remains in limbo with only one building, the municipality building, having been constructed. Currently, Lazika’s future hangs in the balance, as the new government decides its course of action. The architecture of this particular area (Mengrelia – West Georgia) reflects environmental considerations. The region has high level of humidity and dump soil, so local peoples traditionally built houses on stilts with no foundation to encourage ventilation from underneath and keep the structure dry. The site is almost at the existing mean sea-level and hence the client needed to be aware of the risks associated with anticipated global warming and subsequent sea level rises which could be in excess of 1m during the next century (based on climate modeling). The water table is between 1 and 1.5 m below ground level. Our main concerns included the control of settlement due to organic layers and the control of potential liquefaction of the ground during a seismic event. The Caucasus region, in which the site is located, is one of the most seismically active regions in the Alpine-Himalayan collision belt. This seismicity is driven on a global scale by the collision of the African and Arabian tectonic plates with the Eurasian plate. Based on our understanding of the regional geology it is valid to assume one of the worst ground conditions for seismic design – Ground Profile E to EC8. The water table is between 1 to 1.5 m below ground level. The three volumes of this structure are all detached from the ground at different levels. Each of these three shapes are devoted to different functions. Each of these three volumes operates self-sufficiently and has its own entrance from the street but they are also inter-connected. The volume on the ground level is designated as the main Public Services Hall, with easy access at street level. The second volume is dedicated for use as a wedding ceremony hall with direct access to a large terrace. The third volume floats 20m above the ground and contains office spaces. Only pillars and circulation points touch the ground. 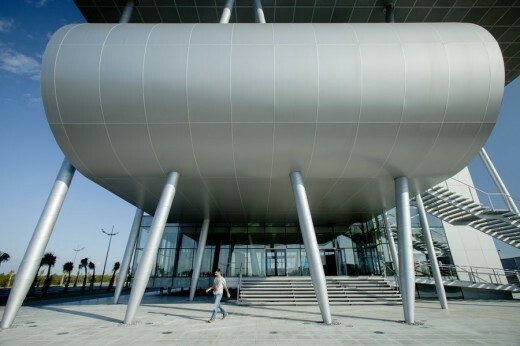 The perforated steel-sheet-cladding finishing of the facade of the top volume bring 50% transparency and lend a solid quality to the volume at the same time. 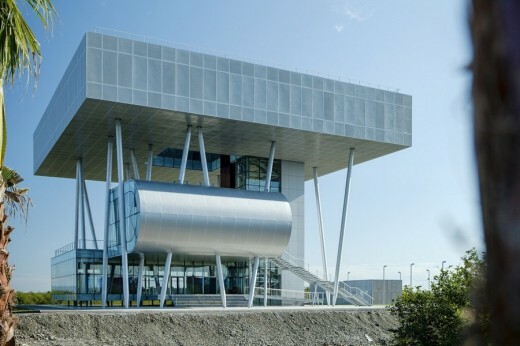 The steel frame structure is integrated throughout all parts of the design and this frame is exposed to emphasise the building’s technology and spirit of innovation. The top volume have the dimensions of 35mx35m, and its downward projection describes the contours of the building – which is a parallelogram containing positive and negative space. A specific appearance was given to each functional volume – the transparent (public hall), the semi-transparent (wedding hall), and the translucent (offices). The public hall has clear walls on all four sides. The wedding hall is a dynamic volume where floor, wall and ceiling utilises the same material – and the curve they describe brings dynamics to the adjacent terrace which lies underneath the top volume. The top volume is an enclosed mass, concentrated on the activity of office work, but it too, gives precedence to the void at its centre. The client needed a public office or a town hall where they could start work on future city planning. They required an accessible Public Service Hall, a Wedding Hall and Offices for about 40 employees, at a size of about 1500 m2. • Primarily, the idea of introducing a sculptural object integrated into the landscape rather than a building. Hence very flat geography of the place floating above the ground offices are used to overlook the New City and New International Port. 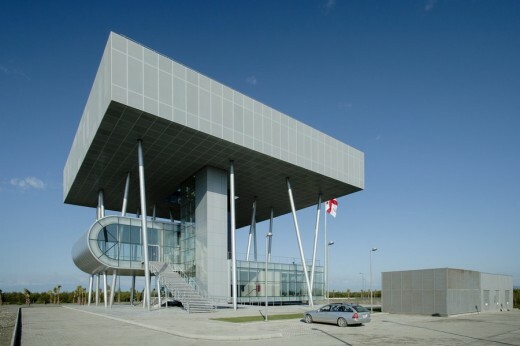 The plinth serves as an office for the employees of the Municipality, while the ground floor volume is dedicated to the Public Services Hall. • A focus has been given to introducing a raised plinth (20m above the ground), which is devoted to the offices. • Public Service Hall is positioned on the ground level with easy street access, distinguished frame and no mullion glass panels. • Introducing the raised plinth as one of the interaction-points of the programme was derived from an analysis of flat geography, public spaces, community life and local climate. The relative access and recreational opportunities for each component of the programme resulted in an optimal development focus to meet all possible public needs. • The building consists of a ground floor with double-height spaces and with a multipurpose roof, wedding hall and offices. All functions of the building have separate access points. Main Contractors: Atak Engineering, Anagi Ltd. Contractors: Atak, Anagi, Metalwell, Reynaers, Gesko, Prolight etc.